HYUNDAI VELOSTER, CLEAN CARFAX, MOONROOF, HEATED SEATS, BLUETOOTH! CHECK OUT THE VIDEO! ARJ'S AUTO SALES IS PROUD TO PRESENT THIS CLEAN CARFAX 2012 HYUNDAI VELOSTER. GREAT COUPE STYLING WITH A THIRD DOOR FOR EASY ACCESS! SPORTY WITH GREY METALLIC PAINT AND A WELL EQUIPPED CHARCOAL & GREY TWO TONE LEATHER INTERIOR WITH FEATURES EVERYWHERE. FEATURES INCLUDE A LARGE MOONROOF, HEATED LEATHER SEATS, POWER WINDOWS, LOCKS AND MIRRORS, STEREO CONTROLS ON THE STEERING WHEEL, BLUETOOTH, CRUISE, CD STEREO, KEYLESS ENTRY, AND A/C ARE ALL HERE IN THIS COMFORTABLE INTERIOR. THE TIRES HAVE GREAT TREAD ON THEM AS WELL! THE 1.6L 4CYL ENGINE PROVIDES PLENTY OF POWER AND EFFICIENCY. COME SEE THIS VERY UNIQUE CAR! WE WELCOME ALL OUT-OF-STATE BUYERS AND TRADE-INS. AIRPORT, BUS AND TRAIN STATION PICK-UP IS NO PROBLEM!!! 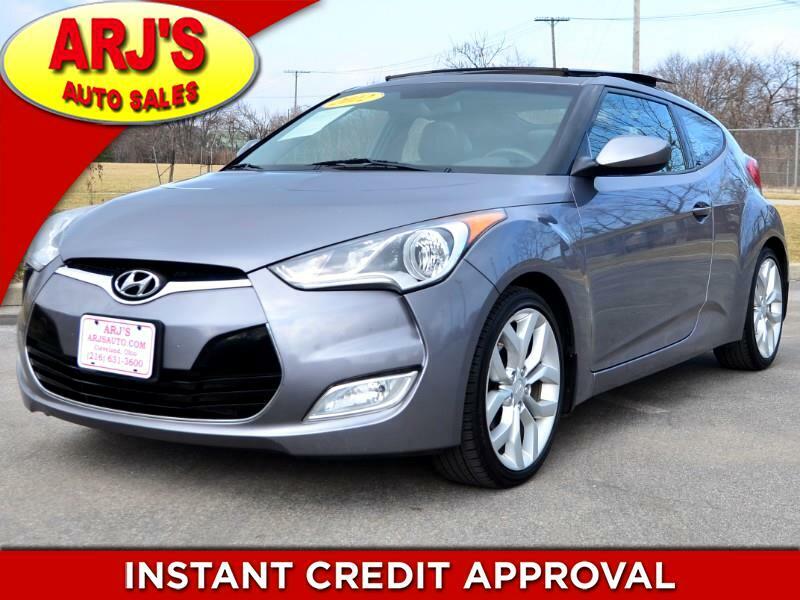 FOR MORE INFORMATION AND TO SEE THIS HYUNDAI, CALL 216-631-3600.